Fires of any kind are devastating. Especially learning that they could have been prevented from happening in your laundry room. 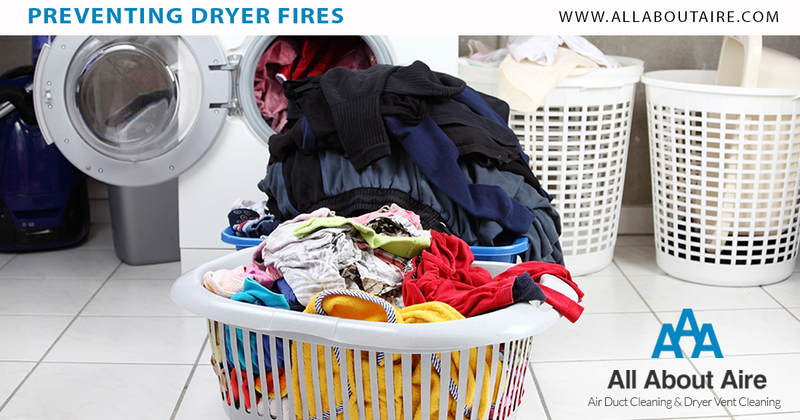 The National Fire Protection Association stated that between 2010 and 2014 US municipal fire departments responded to an estimated 15,970 home fires all involving clothes dryers or washing machines each year. It is important to clean your filters more than just every once in a while. Cleaning the filter every time you use the dryer will not only go to protect your home against fires but allow clothes to clean faster. If your dyer uses a plastic or foil accordion style duct to connect to the vent it can create more opportunity for lint to pile up where it sags. Changing to a metal duct can reduce these chances. Does Your Laundry Take Longer Than Usual To Dry? This could be a sign of a blockage. Check your vent from the outside. If you can’t feel air coming out this can indicate lint has built up not allowing air to pass through. Read more about ways to Increase Your Dryer Efficiency. When treating stains you need to be more careful than just protecting your clothes. For instance, if the stain contains something flammable like cooking oil, gas, or cleaning agents the heat of the dryer can cause a fire. Consumer Product Safety Commission suggests washing the stained item multiple times and avoiding the dryer if possible. To learn more about having your dryer vent cleaned, contact a specialist on our team at (864) 400-8229 or email. Previous PostPrevious Is It Time To Clean Your Dryer Vent?